Clock is not only time indicator, it is a house decoration, an interior detail which adds its style to a room. Whether it’s a big wall clock in the kitchen or an alarm clock on the bed table, they always help complete the house designs and reflect the taste. Clocks today go far beyond the standard cuckoo clocks or old style simple things, but everything from digital clocks to traditional classic clocks can add a touch of personal style and functional flair to the house. To choose and buy clocks for a house or office will be good to consider the size of the room. Big wall-hanging clock will be a nice decision to fill up a blank space in the dining room, small die-cast alarm clock will fit in on a nightstand. A clock should work well with the accessories that already are in the room. Fun design clocks or elegant clocks can make a great difference in the aesthetics of the room. 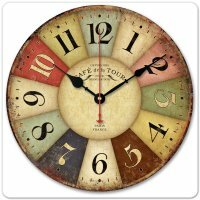 Knowing exactly where to put the clock will help purchase clocks that will fit in and complete the space. There is a wide range of settings that clocks can provide nowadays. Radio clocks, alarms, satellite radio, MP3 hook ups can be included into standard package. Whether these are desk clocks, timers, or specialty clocks and travel clocks, these house appliances are necessary and practical. Clocks serve as lovely house decorations and perfect gifts, for example an antique desk clock. Die cast clocks or executive clocks are beautiful, elegant and make a big impression, they come in different shapes and sizes, from trophies to treadmills. There can be also name or logo imprinted on such a clock to make it more remarkable. Word clocks are clocks that display the time visually using sentences like, for example "It’s about three o’clock." These clocks can be implemented in hardware or software. A talking clock (speaking clock, auditory clock) is a device that presents the time as sounds. Projection clocks are digital clocks which have an optical projector that shines a magnified image of the time display onto a screen or onto a surface like ceiling or wall. The digits are large enough to be easily read, without using glasses, by persons with moderately imperfect vision, so the clocks are convenient for use in the bedrooms. Multi-display clocks are very nice for the office. Some clocks have several displays driven by a single mechanism, and some others have several completely separate mechanisms in a single case. Clocks in public places often have several faces visible from different directions. All the faces show the same time. There are clocks that show the current time in several time-zones. Some equation clocks have two displays, one showing mean time and the other solar time, as would be shown by sundials. Some clocks have both analog and digital displays. Clocks with Braille displays or tactile clocks usually also have conventional digits so they can be read by sighted people. Export Portal offers a wide range of clocks to choose. Buy and sell clocks on Export Portal to get the best deals.